An H-E-B grocery store is expected to be built in what is now the parking of Meyerland Plaza. Photo Credit: Realty News Report. HOUSTON – (Realty News Report) – H-E-B Grocery Co. is expected to announce the construction of a new 100,000-SF store at Meyerland Plaza, a retail center at the southwest corner of Loop 610 and Beechnut, Realty News Report has learned. The new Meyerland store will help H-E-B to fill a void that arose when the H-E-B at Chimney Rock and South Braeswood flooded in Hurricane Harvey. Meyerland Plaza, built in 1957 and redeveloped by Ed Wulfe about 20 years ago, has a number of big box retailers and a J.C. Penney. Meyerland is currently owned by a partnership of Fidelis Realty Partners of Houston and BlackRock Realty Advisors of New York. 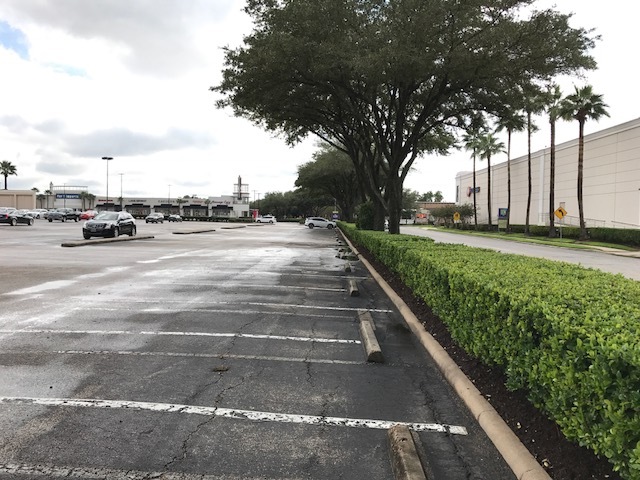 Meyerland Plaza, which covers about 50 acres, has some expansive parking area and various pad site users – banks and restaurants – which could be torn down and used for the H-E-B construction. H-E-B spokeswoman Cyndy Garza-Roberts said the firm is seeking a site in the area, but no contract has been signed. The 950,000-SF shopping center is located just south of the municipality of Bellaire, which has strong demographics and spending power. Meyerland Plaza was built in an earlier generation of retail, before enclosed air-conditioned malls were deeply in vogue. H-E-B is also constructing a two-story store in northwest Bellaire, near Bissonnet and South Rice. It will open in 2018, the San Antonio-based grocer says. The new Meyerland Plaza H-E-B, if all proceeds according to plans, is expected to be a two-story facility. The retail portion of the structure, is expected to be between 95,000 and 100,000 SF. The grocery store is expected to be built on the west side of Meyerland Plaza, near JC Penney. H-E-B, with annual sales of more than $23 billion, operates more than 380 stores in Texas and Mexico.